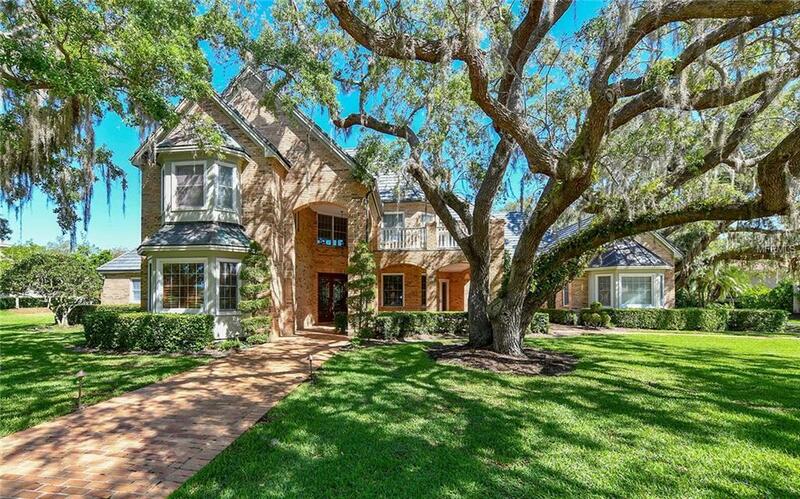 Laurel Oak Estates custom-built traditional brick home on 1.34 acres with mature landscaping. Curved driveway welcomes you to this luxury home and 4 car garage that has AC! From the moment you step in the foyer, you feel the quality of workmanship and see the spectacular stairway to 2nd floor. Wood flooring in major areas, French doors, 2 fireplaces, crown moldings and Anderson windows are stunning features. Gourmet kitchen has been remodeled and top-of-the-line appliances including Fisher Paykel double ovens, Bosch dishwasher, Thermador 5 burner gas cooktop, built-in refrigerator, butler's pantry and 2 TV's for your enjoyment! Master suite with fireplace, sitting room and large closets. Private elevator to 2nd floor with 3BR's, loft area, home theatre and game room. Guest quarters are attached and private. Entertain on screened patio with deep pool, spa, brick flooring and built-in grill. Laurel Oak Country Club memberships available but not mandatory. Two 18-hole championship golf courses, 12 Har-Tru tennis courts and active social calendar year round! Reciprocal with Bird Key Yacht Club. Live the lifestyle. Pet Restrictions Must Be On Leash Or invisible Fencing.